Old guys in polo shirts nurturing vintage Ferraris? Industry people showing off concepts which will never get built? What's the point? Not much: but it's a great way to spend a weekend in Italy. Eight hundred miles in the dark, four hundred milligrams of caffeine consumed from cans and ceramic cups and there it is: Lake Como. The road approaches from the top of the steep hills which flank its five cubic miles of frigid slate-gray water. We descend toward the city of Como then on to Cernobbio, home of the Villa d’Este, a magnificent lakeside hotel built half a millennium ago and for a day every late April, home to a handful of the world’s most beautiful cars ever built. I can feel the small white rocks through the thin Kevlar soles of my sneakers. If you focus your eyes to ground level, a honeycomb pattern emerges, cast by the grille of a red coupé. On this very spot two years ago stood another red coupé, designed by the same man, who is now showing me secret archways of aerodynamics. The car is, of course, Jason Castriota’s Stile Bertone Mantide and this is the Concorso d’Eleganza, a show to fry every brain even vaguely interested in cars. Classic cars, you say? Then what is Castriota’s new concept, unveiled a week ago, doing here? The Concorso was first held in 1929, on the eve of the Great Depression, as a beauty contest—for the most beautiful new cars. It certainly is the perfect geological backdrop for automotive beauty, a stone’s throw from the villa where Anakin Skywalker wed Padmé Amidala, and this will be the very last Darth Vader reference in this blogpost. The Concorso soldiered on through the Depression until World War Two, then was briefly relaunched only to die a quick death and remain in a coma until BMW resurrected it ten years ago. It is now the premium event on the European concourse circuit. There is a tendency among petrolheads to arrive at the cars of the 50s and the 60s as the most perfect embodiment of the automotive form. It certainly is easy to see why. Prior to World War Two, the car was a luxury good, clearly evidenced by the prewar cars which make up three classes of the Concorso. These are mostly huge, baroque battleships and visually, they have more to do with horse-driven carriages than with the vehicles we think of as cars. It is very pleasing to look at, say, a 1936 Auburn, but it would be more at home on the waters of Lake Como as a hydrofoil boat than on the public road. Something happened during the production lull which was World War Two. The cars that emerged in the 50s were smaller, more human in scale, and much closer mechanically to modern cars. To look at a Ferrari 250 GT is to look at a fairly modern sports coupé. There is a particular 250 GT on display, a Lusso, the last model in Ferrari’s labyrinthine first production model, and this car is chestnut brown and was owned by Steve McQueen. It is deeply beautiful and next to it stand a 250 GT SWB, a Lamborghini Miura, Paul Frère’s old Maserati, and so on. Most of these cars were closely related to motor racing, a pioneering and highly dangerous— therefore very cool—activity back then. They also happen to be really pretty. But their prettyness stems not from the fact that they are old, au contraire, they are pretty because they were radically new for their day. The Miura was one of the first road cars to have its engine midships. The Ferrari 250 GT SWB was perhaps the best road racing car of its day. The Jaguar D-Type had disc brakes. These were cars made by people who believed in progress. This is why it’s wrong to treat them as anything other than fine museum pieces and why it’s so refreshing to see new concepts make up a separate class at the Concorso. Concepts which may be very abstract exercises in design, never making it into production, but concepts which may introduce new ideas. Like the many trick wings on the Bertone Mantide. What is the point of it all? It’s hard to tell. There are people here who collect cars the way they collect wristwatches and vacation homes and then there are car geeks with mischievous twinkles in their eyes, people like you and I who happen to be wealthy enough to own an interesting old car and it is their cars which bear evidence to daily driving. But make no mistake: this is a beauty contest. A day of fine escapism, and while there are new cars on display, the answer to the future of the automobile will not emerge from here. However space age the looks, the Corvette ZR1-based Mantide will not be an answer to a world running out of space and oil and filling with people who have never owned a car but would certainly like to do so. Perhaps the best way to approach it is as a game. Dress up in a fine spring suit, grab a glass of champagne, and enjoy the Alpine sun as you walk around the mammoth sycamore by the hotel and lean in close to the leather straps which hold engine covers above triple Webers. Tomorrow will be another day. But if you lean in close enough, you can just about hear a racing V12 scream down the Mulsanne straight at Le Mans. Just make sure you step back when the car’s owner guns the engine for real. These things are LOUD. Next up, we’ll look at the more interesting cars of the Concorso in detail. 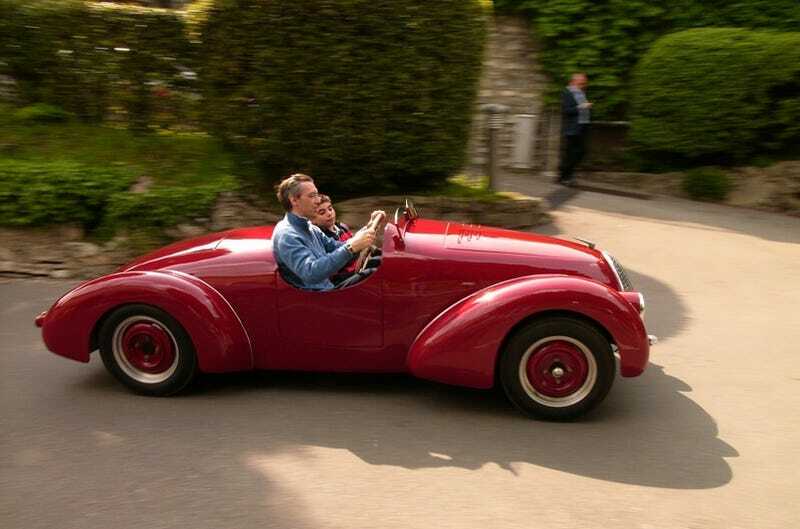 Like this 1938 Alfa Romeo 8C 2900B pictured above, which won this year’s Coppa d’Oro: the grand prize of the event.